Is there really a Tomahawk-plus? Product names like Trident and Tomahawk are created in the marketing department. There is some evidence i.e. Reindeer turds falling from the sky that there is something there. Alpha Networks connected the name Tomahawk-plus with a Broadcom Part BCM56963 in a slide presentation about their products. That part has six 100 Gb/s ports and 48 25 Gb/s ports. The top-end Tomahawk ASIC has 680 Mb (85 MB) packet buffer and supports 3.2 Tb/sec of aggregate switching bandwidth. It can drive 32 ports at 100 Gb/sec, 64 ports running at either 40 Gb/sec or 50 Gb/sec, or 128 ports running at 10 Gb/sec or 25 Gb/sec. The Tomahawks can do a port-to-port hop in 400 nanoseconds or less, which is pretty fast; the chips support RDMA over Converged Ethernet (RoCE) direct memory access technology to get that low latency, a technique that was borrowed from InfiniBand, which still has a latency advantage at 100 Gb/sec speeds. 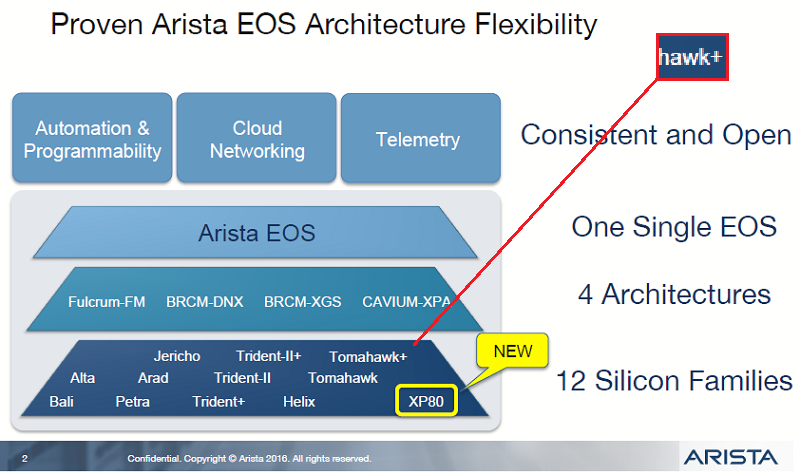 What is new is that Arista is now offering a switch with enhanced packet memory. The 7060CX2-32S has 22 MB while the 7060CX-32S has the 16 MB more commonly associated with the Tomahawk. Perhaps this is tomahawk-plus.